Napoleon spent his six year captivity on St. Helena dictating his memoirs and missing his son, Napoleon II. Officially known as the King of Rome, the Eaglet (l’Aiglon), was only four and a half when his father began what Lord Rosebery termed “the final phase.” The boy spent the St. Helena years in his own form of captivity, cut off from all contact with his father while being raised as an Austrian prince (the Duke of Reichstadt), but answering to Francis. Aside from his literary work and reading, one of Napoleon’s main distractions throughout this period were the island’s children. Napoleon’s befriending the young residents of St. Helena helped him live out these years in the south Atlantic while missing his family. The account of Napoleon’s friendship with the children of the Balcombe family is fairly well known thanks to Recollections of the Emperor Napoleon, written by Mrs. (Elizabeth) Abell. The author was the 13 year-old Betsy Balcombe who became one of Napoleon’s first friends upon his arrival in October 1815. Her account of this friendship was given new life for young readers with the 1997 publication of My Napoleon by Catherine Brighton. The Balcombe’s lived at “The Briars” estate, about a mile and a half outside of Jamestown, the main village and only port. William Balcombe was a minor official of the East India Company, handling provisions for ships putting in at St. Helena. The Briars contained a pavilion, or summer house, and this is where Napoleon stayed while Longwood House was prepared for the Imperial household. Longwood was five miles inland and had been the home of the island’s lieutenant governor. 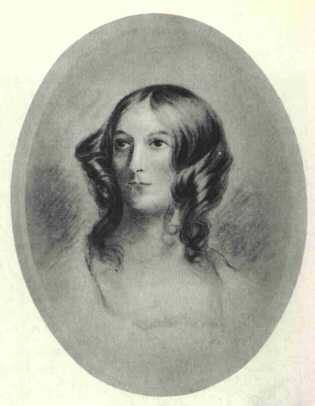 Betsy and her 15 year-old sister Jane both spoke French and had two younger brothers, ages five and seven. Napoleon became friends with all four children and gave them goodies prepared by his pastry cook, played blindman’s bluff, and presented the boys with toy balloons and a toy wagon powered by four live mice. The children, being British, had been raised to fear the monster “Boney,” but he must have appeared to be more of an uncle or grandfather than a feared emperor. They became comfortable enough with their visitor to tease him and even call him Boney to his face. Betsy was his favorite of the four and continued visiting Napoleon after he moved to Longwood. Her father often had business at Longwood since he was assigned supply duties for the Longwood estate. Accompanying Napoleon to St. Helena were the children of his staff and additional companions would be born over the years. The accounts of these relationships are scattered throughout St. Helena literature and usually are not told as a unified story. Of his key household staff, children and one young adult accompanied the Bertrands, Montholons and Emmanuel de Las Cases. The Bertrand children provided the most constant enjoyment for Napoleon. General Henri Gratien Bertrand, 42-years-old and known in Napoleon’s Imperial household as The Grand Marshal, married Countess Fanny Bertrand in 1808. They arrived with three children and settled in a small villa called Hutt’s Gate, a mile away from Longwood. A fourth child, Arthur, was born on St. Helena in 1817. The Bertrands, particularly the countess, were hoping to limit their stay on the island to not more than a year because of the education needs of their children: Henri age three, Hortense age five, and Napoleon age seven. They had agreed to follow the Emperor into exile before the final destination had been announced, hoping, as did Napoleon, that the final destination would be England. Nevertheless, the Bertrands, who had also accompanied Napoleon to Elba, would stay with Napoleon to the very end. Fanny gave birth to their fourth child Arthur in 1817, and he became Napoleon’s favorite member of the family. While Bertrand maintained relations with the British authorities, the duties of running the imperial household fell to General Charles Tristan Montholon, a 32-year-old who had married Albine Helene de Vassal, previously Madame Roger, in 1812. They arrived at St. Helena with their three-year-old son Tristan, but left behind their baby born the previous year considered too young for the journey and Albine’s 12-year-old boy from a previous marriage. She gave birth to a daughter, Napoleone Marie Helene, in 1816. Two years later upon the arrival of Napoleone-Josephine Montholon, there was speculation that the father was Napoleon himself. The Montholon family occupied three rooms at Longwood. 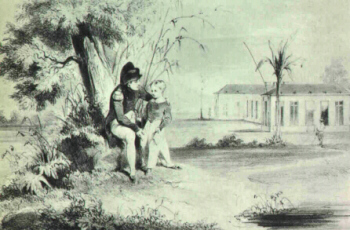 Commenting on the household collection, historian John Holland Rose described Tristan as “the bright little boy of the Montholons.” According to Alan Schom, Monotholon’s presence on the island “was to prove the most disastrous personnel decision of Napoleon’s entire life,” due to mounting evidence -- such as the detective work by Weider, Forshufvud and Hapgood -- pointing toward Monotholon as the one who murdered Napoleon with poison. Emmanuel de Las Cases, nearly 50 years old upon his arrival at St. Helena as Napoleon’s secretary, brought along his eldest son, 15-year-old Emmanuel, “with an intelligence far above his years,” according to one historian. Las Cases, a former naval officer and a count, spoke English -- an important asset to Bonaparte. Usually referred to as “young Las Cases,” the boy assisted his father in taking down Napoleon’s memoirs. An engraving titled “Napoleon at St. Helena” shows the Emperor dictating to young Las Cases. The boy also took down his father’s own dictation for the books that would become the popular eight volume Memorial of Saint Helena. 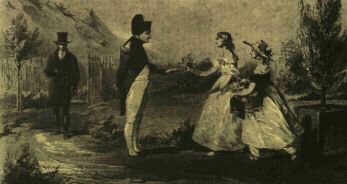 At one point, Napoleon suggested that young Las Cases and Betsy Balcomble should date, but nothing came of it. The Las Cases’ were quartered in two rooms at Longwood. There we have the collection of eight children of the key members of the imperial household making up Napoleon’s circle of young companions. He even showed interest in island children he would encounter on his frequent walks. One story describes his meeting a tenant farmer, his wife and six children. “With the aid of Las Cases,” Ralph Korngold tells us, “Napoleon also spoke to the woman, complimenting her on her brood and asking about the children’s ages and schooling. He had Las Cases distribute coins among the children, while he playfully pinched their ears and noses and pulled their hair. By this time the family felt quite at ease,” adding that a friend of the family indicated that afterwards the children often inquired “When will Boney come to see us again?” The scattered scenes of Napoleon’s interactions with the children in the St. Helena literature sets a light and positive tone to what was otherwise a predictable and boring existence. The children played marbles in the Longwood drawing room, danced and sang. Napoleon liberally disbursed gifts to them and we know that he once gave Napoleon Bertrand and Tristan Montholon each a drum and to Hortense Bertrand a bon-bon box that had belonged to his sister Pauline. Another of Hortense’s gifts was Napoleon’s coat that he wore as First Counsel. On another occasion the Emperor gave Arthur Bertrand the money to buy a pony, while Hortense Bertrand received earrings for her newly pierced ears (which Napoleon supervised). Napoleon Bertrand received a gold watch from the Emperor for correctly reciting his multiplication tables. The Las Cases’ left the island in 1816, the Balcombe family departed in 1818 and the next year Madame Montholon left with her children. The Bertrand children were then the sole consolation left to Napoleon. “There is nothing devious about them,” the Emperor said, “They say right out whatever comes into their heads.” In last year of the captivity, Napoleon Bertrand served as an choir boy when regular masses were organized by the newly arrived priest from Corsica, 66-year-old Abbe Buonavitan. Napoleon Bertrand served as a pallbearer and Henri Bertrand carried a censer in the procession, while Hortense and Arthur followed behind in a two-wheeled open carriage. with their mother. Two of the Longwood children, Arthur Bertrand and Las Cases, Jr., returned in 1840 with the French vessel La Belle Poule to bring the body of their old friend home to Paris. Arthur then wrote Letters on the Expedition to St. Helena in which he recounted the fun the children had with Napoleon. Napoleon’s thoughts were often with his son, and he treasured his paintings and marble bust of the King of Rome. While he did not often talk of the boy to the household staff, he must have seen the Eaglet in the young smiles and laughter that filled his years at Longwood. Tom Vance, retired from the U.S. Army Reserve as a lieutenant colonel, lives in Michigan where he works for a public school district. His articles on Napoleon have appeared in Military History, British Army Review, The Napoleon Series electronic magazine and the Napoleonic Literature web site. Bertrand, Henri-Gratien. Napoleon at St. Helena (deciphered and annotated by Paul Fleuriot de Langle and translated by Frances Hume) Garden City; 1952, P. 292; and J.C. Herold. The Age of Napoleon New York; 1963; P. 418. Kerry, Earl of (editor). The First Napoleon: Some Unpublished Documents From the Bowood Papers Boston; 1925. P. 195.